These historical egyptian miniatures are made of polyresin, hand painted and polished. Color tone may vary from picture. They measure approximately 3.25" tall, 1" wide and 1" deep. 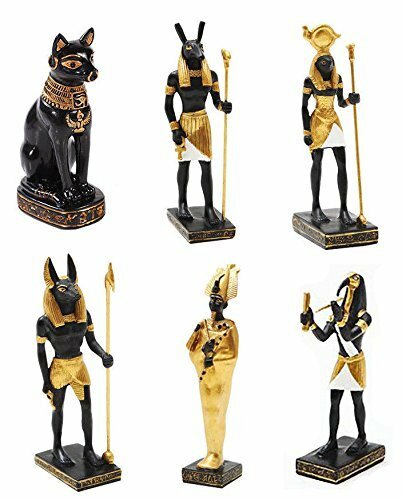 Celebrate the best of the Ancient Egyptian Civilization with these miniature Gods. This miniature set consists of Anubis Osiris Seth Horus Bastet Thoth in their classical black and gold personifications. Use them as a teaching tool for great minds or collect them for yourself!! !